Welcome back to Red Ted Art and this week’s “How to”. 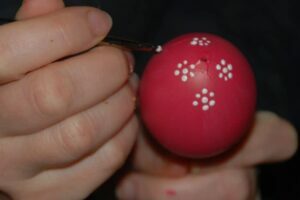 Once again, I am not sure if this a “how to” as such, but I guess if you have never done Easter Egg Blowing, it will indeed be new to you… for those of you that have, it will hopefully serve as a reminder, provide you with some handy tips and give you a pretty and VERY simple “Austrian” Easter egg design – it is one of my favourites ever and I use it on many things! 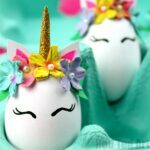 I also have a fun easter decor for kids idea coming up very soon .. so be sure to be back! I love blown eggs as they have something wonderfully delicate about them! Quite pretty I think! 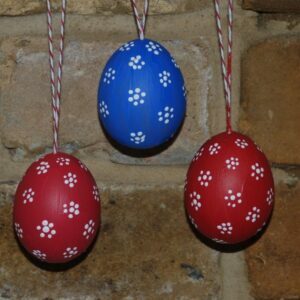 I also love this craft, as it is incredibly thrifty: you still get to use the eggs! So it is virtually FREE! Only costs to you are a ribbon, a pin and some paint! I used acryclics – they are strong bold colours. 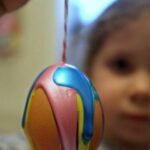 You can use food dies and die your egg by – mixing 10-20 drops of food die with 1/2 cup of water and a tablespoon of white vinegar. Submerge egg with help of a spoon and leave for 20-40min. I found the results so so. Definitely worth experimenting with! 1) Prick holes on either end of your eggs with a pin – I usually make the holes around 4-6 pin pricks big. You can make them smaller, but the blowing is much harder! If you get the pin prick holds big enough the blowing really isn’t too hard – can almost do it one breath! 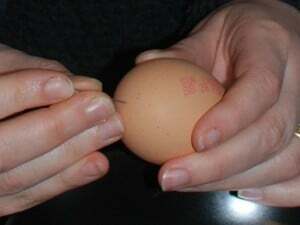 2) If your needle reaches try and prick the yolk – this will make things easier, but don’t worry if you can’t! Huana in the comments suggested using a toothpick – great idea – piercing the yolk REALLY helps and will stop you “passing out”! 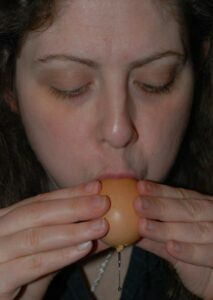 3) Hold the egg steady in both hands and blow through the top hole. This is no easy task, you may want to make your hole a little bigger. But it is possible! Out 12 eggs, I have only broken one… and that is because I got impatient and hurried it. 4) Give it a wiggle with your pin if it helps! 5) Once, everything is out, I like to rinse some water through the egg. NOTE: we make the holes “bigger” now – which means my kids (10 and 8) can manage the blowing! They LOVE doing it themselves and I think this is a real memory maker for them! 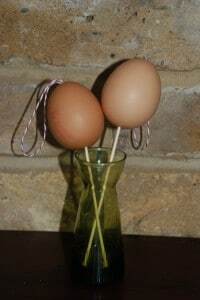 I found it very useful to “skewer” the egg with a thin wooden kebab stick – this makes painting and drying much easier! Alternatively, you can hang it first, but I still find that a little messy! 1) Paint a base colour – match your decor. Darker colours provide a nice contrast to the final design, lighter colours look fabulous for spring! And this is the result using Yellow (yes, yellow, it turned red) and Blue (?) food die! 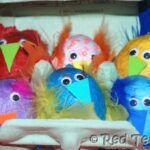 The blue really didn’t work well – key thing is to juts “pat your eggs” dry and not rest them on the paper towel for too long! 3) Once dry: tie some thread/ ribbon to the pin. 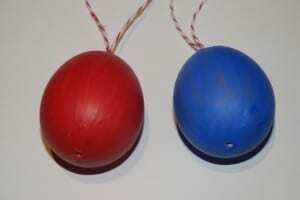 When it is hanging the pin and the string will form an upside down T in your egg, which is what holds it in place. I find these quite addictive. And since giving them a go again a week ago or so, I can’t help but blow out every egg I need for cooking. 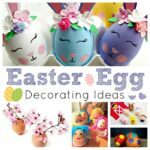 They make FABULOUS little Easter gifts too! They are adorable, thanks again Maggy! 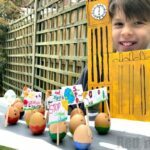 That might be a less messy way of letting the kids ‘crack eggs’ than on the side of the bowl too! Thanks for the idea. 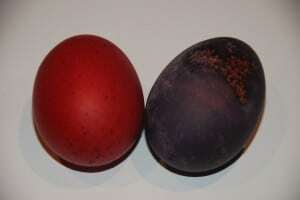 Now is the time I REALLY wished I still have my chooks, for unstamped eggs. Maggie, these are so pretty. They look beautiful hanging on the tree! How beautiful. 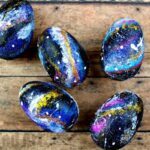 My MIL hard boils hers and paints them, I have always blown eggs lol. Use a toothpick to prick the yolk,I do that manny years and it’s so much easyer! Oh, I love the purple and pink ones! 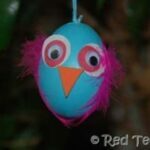 I may have to blow out my eggs and save them so I can make several of these! What a thrifty craft! And cute too! These are amazing! I love them. 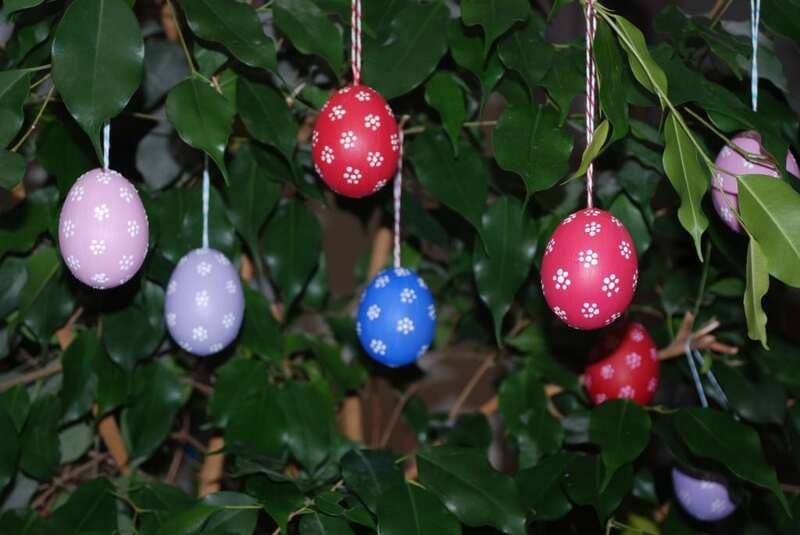 What a great decoration they would be hanging outside in our rose bushes, or inside at our Easter party. Thanks so much for sharing. I am definitly going to bookmark this one to try. My children and I were chatting about this whilst picking up some eggs yesterday think will have to have a go :)as my son couldn’t believe that you can get the yolk through such a tiny whole. Hello, I still don\’t get the idea of how to put the knot inside the egg, do you have more photos to illustrate? thanks heaps!! I am having PC issues at the moment, but as soon as I am back to normal, will add some photos!! Thanks so much for some refreshing and fun non-chocolate ideas. I am inspired!!! Just wanted to let you know that this tutorial was great! 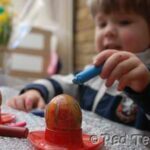 I linked to your site at http://blogging-mama.com/holidays/blowing-out-eggs-for-easter/.